AceMoney is a product developed for everyday tasks of personal finance management. It allows to track your cash flow in multiple accounts, keep an eye on spending money by categories and payees, and satisfy a lot of questions like "how much did I pay for the food last month?" with one click of a button. It can generate many different types of reports. Compatible with QIF file format: most banks use to provide data online. Just download a file from the web site of your financial institution and import it to the account registry. It is designed for regular people that don't have special accounting skills or banking tecniques. AceMoney Lite has all the features of its big brother except multiple accounts management. As AceMoney, this helps people organize and manage their personal finances quickly and easily. It supports all the features required for home or even small-business accounting needs. I bought the Pro version a while back . I liked the way it worked until i tried to set up some automatic deposits....not as versatile as it should be. A note to support about the inability to set a deposit as "4th wed of each month" got a response that simply said " we cant do that".... Quicken does, MS money did, and several other accounting pgms do that. So went back to Quicken. Other than being limited in custom auto transactions, it is a good pgm..
After Microsoft Money was discontinued, I decided to get new software when I switched to a different bank and had a new account. This is the best one I tested, and it's still working out great for me. The interface could be nicer, but it works well and although the program is simple and limited to my checking and saving account, I realize I never used all the extra stuff in MS Money. This is just what I need. 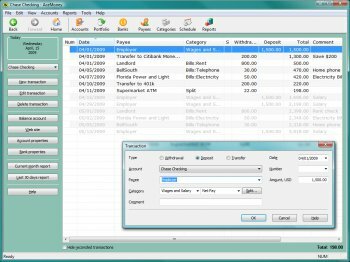 Best software I've found for personal bank/budget management. Tried many of the other bigger ones but none were as easy to use. Undesired Username - you're boring. The fact that the "Lite" version is rated more highly than the full-featured version goes to show how utterly stupid people are. Oh wait, I know, this one is free. The power is there however the interface is AWFUL. It hurts your eyes to use and is difficult to navigate. There are better pieces of software out there for free, MUCH better! 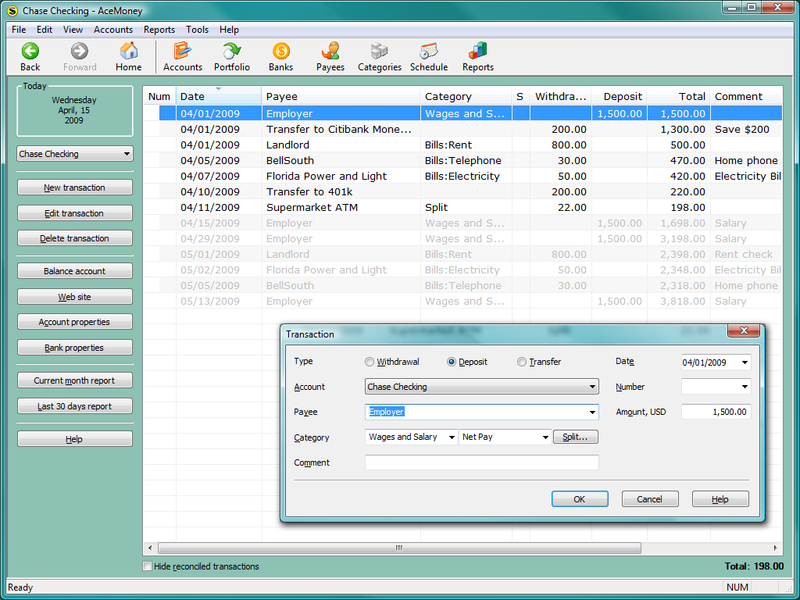 Best I've used so far for money management software. GUI could use a few more options but overall it's very usable. A nice little program. Could improve the GUI though, its pretty ugly. Free! You certainly can't go broke with that! A great program, esp in that it supports several import formats so you can d/l your acct info from, eg, your bank, credit cards, etc. It does QuickBooks and several others. Limited to one account only, but if you have little $$$ like me [mostly, "balancing" my wallet], it gets the job done. I used the freeware version of AceMoney and now I use the paid version of the program. Both are perfect. I like them much. I am neither American nor British and the programs support all the currencies of the world. The programs are simple yet powerful. I like the perfect simplicity, so I could use it just out of the box, without reading thick manuals. They do what they say, and they do it as I expect. Two thums up! This program is a great, no-nonsense way of organising your personal finances whilst avoiding the bloated offerings from Quicken and Microsoft.